I really like this lightweight blanket. It doesn’t snag like my others. I wish I had seen this blanket first after I bought 3 of one that snags. Made from 100-percent cotton, this knit blanket is perfect for warmth and comfort all year round. 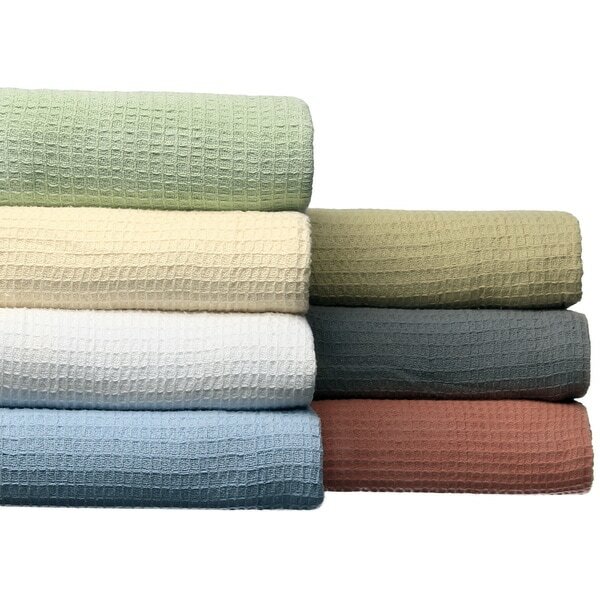 Designed with self-binding edging this thermal blanket is available in multiple colors to easily match existing decor. This blanket is available in multiple sizes making it a perfect gift. Machine washable for easy care, this blanket will provide your bed with a cozy and casual look. This is a nice simple, basic blanket. Cotton weave so expect a few snags over time. Not a soft super plush blanket but nice clean looking cotton weave. I bought the orange color to use folded at the end of my bed for when I take naps. Color is a nice light orange, not overly bold . Works great for me. And it did not seem to shrink much after I washed it... but I did not measure. Just noticed it still draped over the sides about the same amount after washing and drying. if you re looking for a true blanket this isn't it. the word thermal is deceiving. I thought it would be much heavier than it was. I find it more of the kind a blanket you would use in early spring/fall but clearly it is not a winter blanket. I would not even call it a blanket but a throw. it was pretty thin. and for the price I was hoping for more of a blanket. This is a great blanket. It holds it's shape and keeps me warm. It would be perfect if it was about 6-8 inches wider! Frankly, i see no reason to go a lot more high-end for a cotton blanket whpen it's possible to find one as soft and prettily textured as this one. It layers perfectly. The weave of the blanket doesn't make it any more prone to snags than blankets made by B--- , ETC. This blanket is not made from combed Egyptian or American Supima cotton, which makes it only slightly less soft. Probably the best kudo forthis one is that our family -- in the process of moving our kid to school --had to sleep on the floor for 9 days, waiting for our mover to get it all figured out (another story). This blanket was used as a bottom layer for a homemade sleeping blanket and held up to the task without pilling, shredding or snagging. I haven't laundered the blanket yet, but it arrived plenty large to allow for any shrinkage. I wasn't paid to write this review -- and can still highly encourage you to consider choosing this product. Excellent service. The blanket true to color, well made, well packed and presented. I bought it for my sister in England. for cold weather. I tried many website until I remembered Overstock. com. I have never been disappointed with any or the products I have received from them. I'm very happy with this blanket. It is very warm, which is what I wanted. I ordered gray. It is a lighter shade than I expected. I like the color. The blanket is the right size, not overly long on the sides. I would have given this five stars except for one thing. The seller took a really long time to ship. Maybe this was due to the holiday season. Once the blanket finally shipped, I got it pretty quickly. It arrived within the allotted time. But while I was waiting for the blanket, I was chilly in bed. Soft, good weight, washed it before using it. The dryer vent was full, 2 inches of white fluff. Hope it doesn't continue to shed like this! This blanket is so comfortable. Not too heavy and not too light! Perfect for year round! I purchased this blanket for a pull-out trundle bed that I make into a king when I have a couple visiting, so I don’t use a spread. The look of this thermal blanket, which I purchased in a yellow/maize color, is perfect without a spread. We live in a tropical climate, so it is a good choice when only one blanket is needed. Washes beautifully, and stores away nicely folded in one of those vacuum storage bags along with the sheets for easy access. Highly recommend the thermal, for cooler or hotter days. washed before I used them. very thin and unstable weave. very linty, all the cotton was in the lint trap. Would not recommend, poor value, too thin as a blanket, too flimsy made, I'm afraid they won't hold up for another wash. Excellent quality, washes very well and my grandson loves the softness. Great blanket purchase!! Great layer to have to keep warm, not too think or thick so perfect for all seasons, looks really pretty! Already washed it and dried it and it held up without shedding fuzzies everywhere or snagging. Happy with purchase and would buy another one if I needed one in the future! Was happy upon receipt of the item. However, once I laundered the blanket it started "shedding" or "peeling" - the lint got everywhere! I was wearing black yoga pants when I took the blanket out of the dryer and was completely covered in blanket lint. Sorry - but I wouldn't buy another of these because of this. I love my new cotton thermal blanket. It is so comfortable and a nice treat for myself. Color is beautiful and just the weight I was hunting. Ordered this in white and it is exactly what we needed! Warm without being stuffy - super breathable. Comfortable and very soft. I would not hesitate to order it again! Very light and comfy for any time! The light green color is soft and pretty, and the blanket is just warm enough for cool spring nights. I've only washed it once, but it didn't shrink. This Thermal Blanket is just right for Spring/Summer/Fall seasons. This is a good quality blanket. It does seem like it will be a good year round addition to my bed. It adds warmth in the winter but it's not so thick that it will be too hot in the summer. I'm very happy with my purchase and would recommend this blanket. The blankets come in standard sizes. As you progress in your order the size and cost will both be identified. These blankets tend to get larger in time as the weave loosen; I personally think this adds to the comfort! I hope this helps in your order. To protect the comforter and/or to provide additional warmth when needed. I bought one of these before and love it! "price on king size all seasons thermal blanket #15682394"
Hello pennysmith, You can view the prices of each option be clicking on "select an option" drop down menu. Prices can vary depending on color as well as size. I hope this information helps. Thank you for shopping with us.